Today we’ll be wrapping up our 4-part series on slatwall displays. Our focus throughout the series has been to discuss ways in which your slatwall display can be made more attractive and more effective as a merchandising vehicle. If you did not have a chance to catch the other blogs in this series, you can review Part I here, Part II here, and Part III here. These earlier posts are filled with slatwall display examples that we hope will inspire you. We start today’s blog with a complete wall merchandising system that we designed for Top of the World’s headwear program. Our objective was to develop a slatwall-based heavily branded, space-efficient headwear section for retailers who were interested in developing a high-volume headwear program. We created individual wire cap pockets with rear slatwall brackets and an oval screen-printed front branding plate. Each cap pocket was designed to hold 8-10 pockets so the cap wall shown below had a holding capacity of 70 SKUs and a total of 700 caps. We designed a 3-part digitally printed PVC flag sign system to promote the Top of the World brand and create a visual boundary for the merchandising presentation. We also included a 3-part curved header system with center brand graphics flanked by lifestyle images. All the design elements worked in concert to create an impressive and inviting headwear showcase. 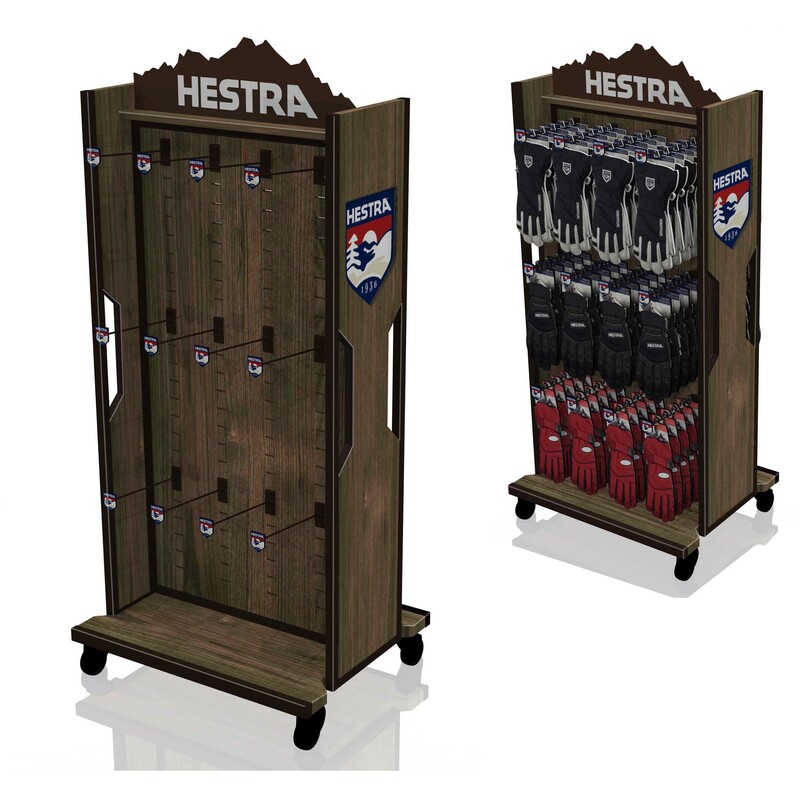 Our second example is a slatwall glove display we designed for Hestra. While it’s not technically a statwall display, we wanted to include it since it would have been easy to use slatwall on the back panel. Instead, we used a slotted MDF panel which was designed for fixed hook locations. This display featured a structural metal base on casters with wood laminated MDF panels, matching side panels with cut-outs and vinyl graphics, and a CNC-cut “mountain” header with a screen-printed logo. The display held 3 rows of gloves on each side and accomplished its objective of communicating the rich heritage and quality construction of Hestra’s gloves. There’s nothing incredibly imaginative about out next example, but we wanted to show it as an illustration of a different type of slatwall unit configured in the familiar 4-sided “H” shape. 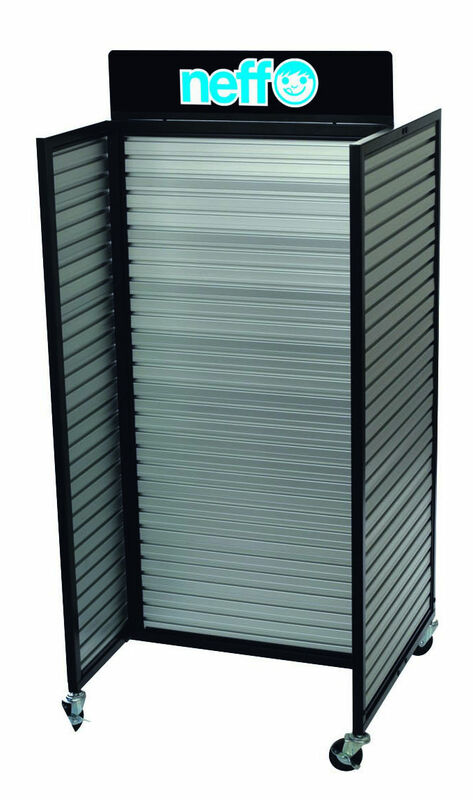 The Neff display below was designed with a black metal frame and silver anodized aluminum slatwall. The main three advantages of this display are: (1) It is significantly lighter weight than standard slatwall so shipping and handling are cheaper and easier, (2) It is super durable since aluminum is long lasting and is not at risk for chipping like some types of MDF slatwall, and (3) This particular slatwall design has a much tighter slat pattern than normal 3”-on-center slatwall, thereby providing for more merchandising flexibility. 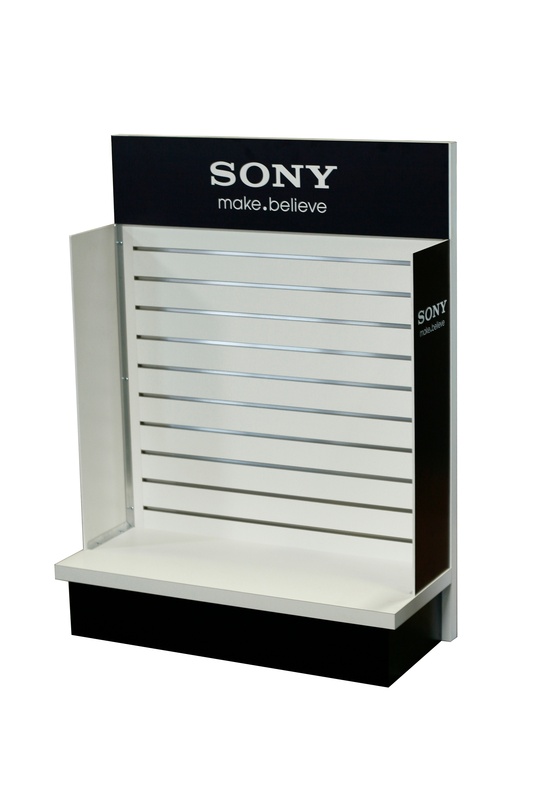 Our fourth example is an illustration of a 36” wide freestanding endcap display we designed for Sony. While there is nothing fancy here, we wanted to share this display as an alternative to the existing metal Lozier endcaps that are commonplace at retail today. Most of those endcaps have pegboard back panels so an upgrade to slatwall with aluminum inserts, MDF base, branded side panels and matching header makes for a nicer, more upscale presentation. One way to dress up slatwall is by having branded hanging signs and accessories. 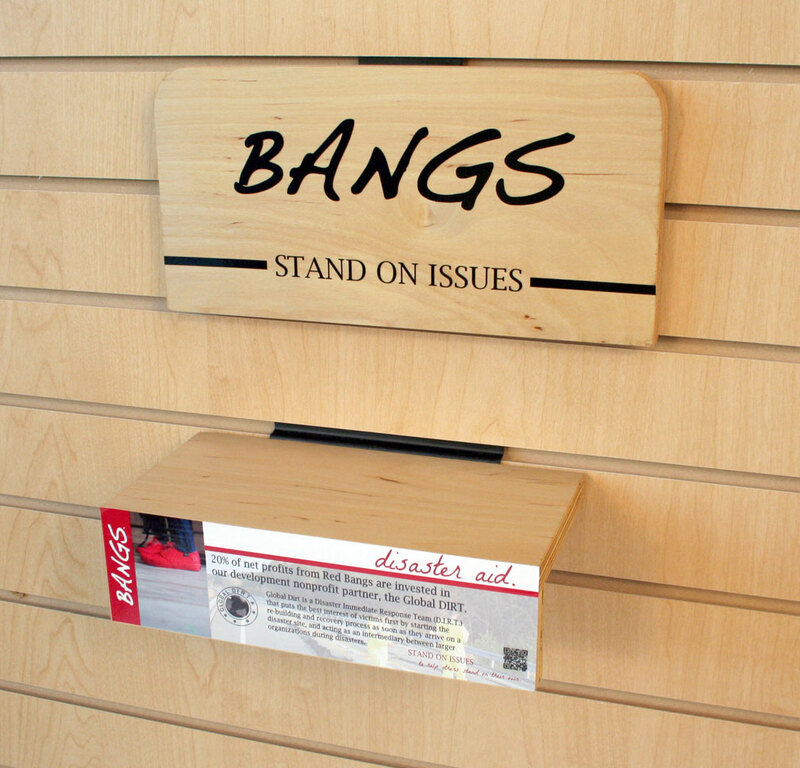 The example below if one we designed for Bangs. They used the Bangs slatwall sign as a way to promote the brand and serve as a unifying design element for the shoe shelves that were hung below the sign. The birch plywood slatwall shoe shelves matched the slatwall décor and provided each glorified shoe with an opportunity to communicate its own cause marketing message via the vinyl graphic on the front lip of the shoe shelf. A similar example is the design shown below which we did for Mountain Horse’s footwear line. 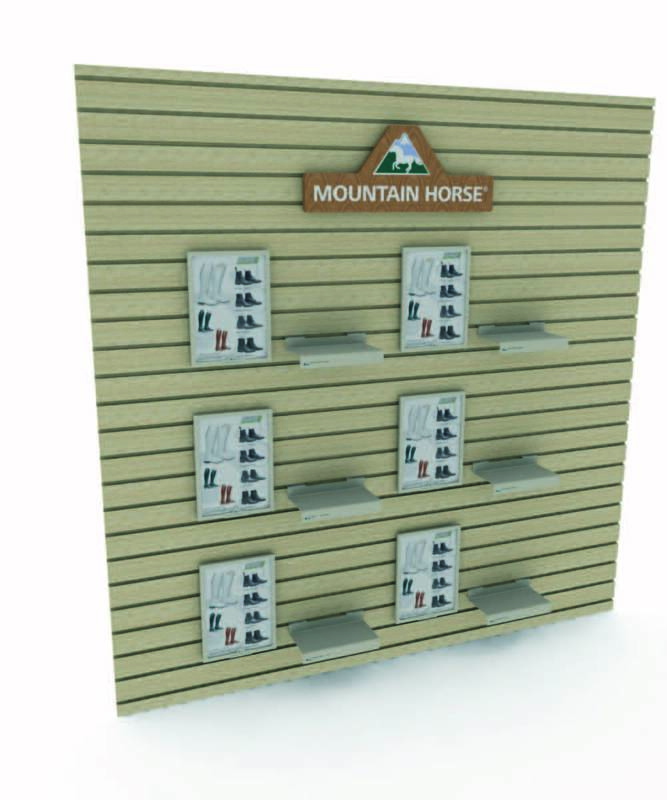 The hanging Mountain Horse slatwall sign draws the shopper to this slatwall section, identifies the brand, and marks off the real estate on the wall. We added sheet metal shoe shelves with screen-printed branding on the front lip and finished the display with slatwall signs which contained explanatory product graphics. We’ll end today’s post with a simple reminder about the importance of branded accessories. While it is key to stay tasteful and guard against overbranding, using accessories that have branding elements can be a great way to keep your brand front and center and also create a great look. 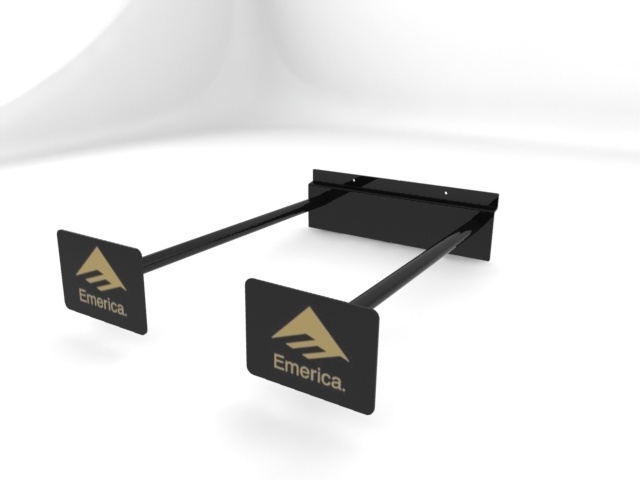 An example is the branded Emerica slatwall hooks shown below. By simply creating a sheet metal plate at the end of your slatwall hook, you can add a screen-printed logo very easily and affordably. We hope you enjoyed this series on slatwall displays. 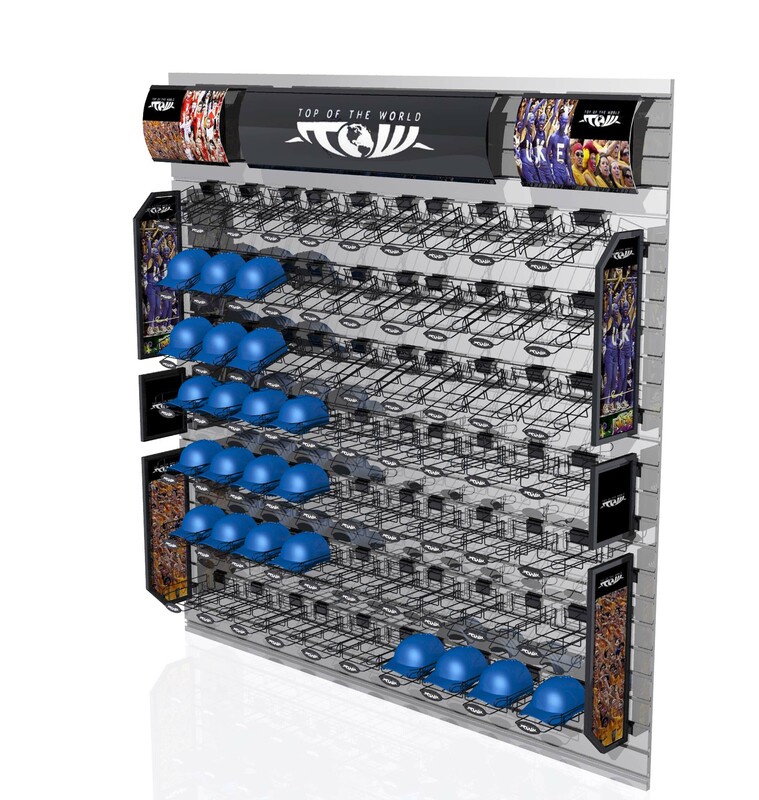 The main take-away is that slatwall can be a great merchandising vehicle, primarily because of its flexibility and availability in the industry. But, don’t settle for a boring slatwall display. There are many creative and economical ways to spruce up your slatwall display, capture the attention of shoppers, and drive incremental product sales.